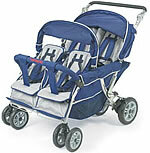 Bye Bye Buggy USA sells top of the line multi-user buggies and strollers. The Angeles Bye-Bye Buggy and Bye-Bye Stroller are industry standards for schools, daycares, preschools, and other child care organizations. The Buggies and Strollers are also made in the USA. Here are some frequently asked questions, with our responses to them! If you have any other questions, just phone us toll free today. We have five Certified Playground Safety Inspectors (CPSIs) on our staff, who can talk to you today. 1. Who makes the Bye-Bye Buggy and Bye-Bye Stroller? 2. What configurations of Bye-Bye Buggy and Bye-Bye Stroller are available? The Bye-Bye Buggy and Bye-Bye Stroller are each available in a 4-seat model and a 6-seat model. The Bye-Bye Buggy is available with thin wheels or fat tires. 3. What’s the difference between the Bye-Bye Buggy and the Bye-Bye Stroller? First, the Bye-Bye Buggy is made from a single piece of plastic, and it does not fold. The Bye-Bye Stroller, on the other hand, folds down for easy storage. Second, the Bye-Bye Buggy comes completely assembled, whereas there is some assembly involved with the Bye-Bye Stroller. 4. Do the Bye-Bye Buggy and the Bye-Bye Stroller fold up? Both the 4-seat and 6-seat Bye-Bye Stroller fold down for easy storage. Neither the 4-seat nor the 6-seat model Bye-Bye Buggy is foldable, because they’re both made from a single piece of plastic. 5. How do the Bye-Bye Buggy and the Bye-Bye Stroller get shipped to me? The Bye-Bye Buggy ships in a single box, via motor freight. The Bye-Bye Strollers, which are foldable, ship via UPS. 6. When the child buggy arrives at my door, how many pieces are they in? The Bye-Bye Buggies ship fully assembled. This is true for both the 4-seat Bye-Bye Buggy and the 6-seat Bye-Bye Buggy. Unfortunately, for the Bye-Bye Strollers, some assembly is required. The good news is, it’s easy to do. If you’re in the DC – MD – VA area, we can help you with this. Our company has built dozens of commercial playground structures, so the Angeles Bye-Bye Strollers are very easy for us to put together for you. Our professional staff includes 5 Certified Playground Safety Inspectors (CPSIs) who know playgrounds and recreation back to front. We handle these projects through our parent company, Maryland Materials. 7. Where are these items manufactured? The Bye-Bye Buggy and Bye-Bye Stroller are made right here, in the USA. The manufacturer, Angeles, is located in the city of Pacific, Missouri. 8. How much do these items cost? For pricing information, please see the specific pages for Buggies and Strollers. Please note that these prices do not include the cost of shipping. 9. Do the Bye-Bye Buggy and the Bye-Bye Stroller come with a warranty? Both the Buggies and Strollers have a 3-year warranty.